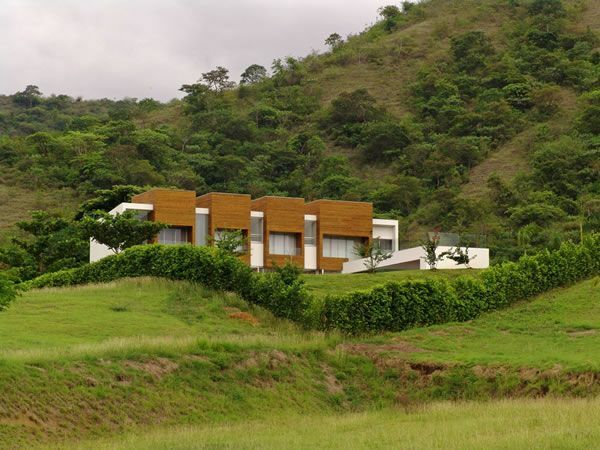 Meet this impressive house designed by Eduarda Correa. Away from the city rush and away from the chaos, in a place where relaxation reigns, in Morro do Chapéu, Bahia, Brazil, there’s a spacious luxury house, characterised by sophistication. The excessive use of wood and stone define its personality. The residence looks like a palace and it features wonderful views over the mountains. Zen and peaceful, this exquisite living space is absolutely gorgeous. High-end facilities, impressive design and expensive decorations. On top of that, a warm home environment and a sophisticated rustic kind of feel. Some would say that, this house has it all. Like we previously mentioned, the house is equipped with everything, in order to make you feel like you’re living inside a palace. You’ve got the sophisticated rooms with panoramic views, your very own home theatre to watch whenever you like whatever you like, without depending on a sharp movie schedule and a wine cellar for tasteful evenings. The precious interior boasts stunning works of art, such as sculptures and paintings. Neat, bright and elegant, this spectacular residence is one of those lovely homes we’ve always wanted to wake up in the morning.